The leftist party Meretz has doubled its seats in the new Israeli Knesset - to six. But while one will be occupied by an Arab, the rest will be reserved for Ashkenazim, explains Tsafi Saar in Haaretz. In case you' re wondering why Mizrahim are missing from Meretz - the answer is simply that the far left has never shown much understanding of their abused human rights and painful history in the Arab world. The Meretz representatives are all good people. Their heart is in the right place. Good souls. Which brings us to their election campaign, an effort rife with mistakes. It started with the patronizing slogan "Your heart is on the left, neshama" – that final word, "my soul," is a term of endearment characteristic of non-Ashkenazi speakers of Hebrew. Then there was that video that mocked people taking part in the Revivo Project, a revival of old songs from Middle Eastern Jewish traditions, one of the best music projects in recent years. It sometimes seemed as if the campaign were trying to persuade people not to vote for Meretz. The thing is, the Meretz people really are good people. And smart – they have an explanation for everything. When asked about their lack of Mizrahim (Jews of Middle Eastern origin), they noted that their three top spots were filled by a woman, a disabled person and a gay man. About the mocking video, they said it was made not by the party but by its supporters. Even if in some cases such answers are acceptable, the questions leave no room for doubt: The party has a problem. A big problem. In fact, Meretz is continuing the Israeli left's long and inglorious tradition of (in the best case) ignoring Mizrahim, including the Mizrahi left. In the past this was clear racism. What is it today? Why the insularity and foregoing of activities with people committed to similar values? How can it be that a party that waves the banners of human rights, equality and pluralism is sending to the Knesset only people from a hegemonic class? How come its leaders don’t understand that this produces a lack of trust, which the high-flown words, the willingness and even the worthy actions won't dispel? If Meretz wants to establish a real and broad left, it has to start now. Yesterday it should have begun a thorough inspection, not to say revolution. First, its men and women must acknowledge the problem. There is no escaping it, and no intellectual explanation will sweep it under the rug. As every female politician in Meretz no doubt knows, men, no matter how progressive and enlightened, cannot faithfully represent women’s interests. In this way, Ashkenazim cannot represent Mizrahim, and the same applies to Jews and Palestinians. Throughout the country groups of activists are busy at work, and if Meretz has the sense to realize that they are its only hope (not the other way around) and to cooperate with them – not as a senior partner and patron – hope could spring here. And it wouldn't just be for the party, but for all Israel. Jamel Bettaieb comes from Sidi Bouzid, the birthplace of the Tunisian revolution. The young language teacher and activist was at the heart of the protests that led to the downfall of the Tunisian president and triggered the Arab Spring. Bettaieb is now concerned that freedom of speech is providing a platform for extremists to voice hate campaigns against Tunisia's Jews. "In the last few months an imam went on television and spent an hour speaking negatively about the Jews. Where was the reaction of the government? There was nothing. I criticize society. Civil society should say this is unacceptable. People should care," said Bettaieb. Rise of Islamist politics: Under President Ben Ali, Islamists were arrested and political parties banned. Now, however, the country is experiencing a religious revival. Tunisians chose the moderate Islamist party, Ennahda, to lead their first democratically elected government after the revolution. Ennahda's leadership has promised to protect Tunisia's Jewish community but many grassroots supporters are hostile to the Jews. The country's growing ultra-conservative Salafist movement are thought to number 10,000. Eyewitnesses say the group has been chanting anti-Jewish slogans at protests in Tunis, the Tunisian capital. Salafists have a strict interpretation of the Koran and believe in creating an Islamic state governed by sharia law. Thousands of Salafists who had been imprisoned by Ben Ali were released after the revolution. Many in the Jewish community quietly admit that they felt safer under Ben Ali. "Now we live in fear of the Salafists," one woman told DW. For the moment, much of the anti-Semitism has remained rhetoric. But the potential for violence remains very real. Tunis' central synagogue on Liberty Avenue is surrounded by barbed wire and protected by armed soldiers. Built in the 1930s, the synagogue stands as a symbol of the community's confidence. Today, only a shadow of that thriving community lives on. A tiny community remains: In a hall backing onto the synagogue, a gathering of Jews celebrate a rare occasion: a bar mitzvah. The celebration marks the coming of age of a Jewish boy. Tunisian Jews have travelled from France and the Tunisian island of Djerba, home to the country's largest Jewish community, to take part in what has now become a rare celebration in the capital. There are only a small number of young Jews among the guests. Even their parents' generation is scarce. The Jewish community is ageing. Roland Sa'adon is the cantor, or singer of prayers, at a synagogue in La Goulette, a seaside suburb of Tunis. He has spent all his life in Tunisia and wants to remain in the country of his birth. Like many Jews here, his children live abroad, and soon he will be forced to leave Tunisia to be with his family. Since the revolution, Sa'adon has come to believe that the future of the Jewish community is at risk. "The Islamists have taken over the revolution, a revolution that was led by young people," he told DW. "If the Salafists win support then it will be difficult - not just for us, but for many Muslims as well. I don't think most Tunisians are extremists, but if they are and that's what they choose, then there will be no place for us in Tunisia." One of the few younger guests at the bar mitzvah, Isaac Hayoun, says that while he feels safe in Tunisia, he too will leave. “I am practically the only young practising Jewish teenager in the capital," he told DW. "After high school I will move to France." Jews have been gradually leaving the country since its independence in 1956. Many moved to France and Israel. Some left for financial reasons; there were more opportunities abroad. Others left after the rise in anti-Semitism that followed Israel's conflicts with the Arab world. Remembering Jewish history: Habib Kazdaghli is a professor of contemporary history at the University of Tunis who specializes in Jewish history. It is important that all Tunisians learn about the country's Jewish community, he says. "Our country lost part of itself. We must now teach students about our past. I now have many students who are not Jews," he explains. "It is not a Jewish past, it is a Tunisian past." Seeking to preserve that past, a new museum and website called Dar El Dhekra (meaning "House of Memory") has been founded. It's dedicated solely to Jewish history and culture in Tunisia. For the moment at least, this tiny community appears to be hanging on to see what post-revolution Tunisia has in store for them. What is it with British cartoonists? Steve Bell of the Guardian, Gerald Scarfe of the Sunday Times and Dave Brown of the Independent all seem to have lost their moral compass when it comes to the Middle East, producing work indistinguishable from the blood libels of the Arab press. Steve Bell believes the very opposite of the truth: that Israel was founded on the ethnic cleansing of the Palestinians. Has he never heard of the 800, 000 Jews who really were ethnically cleansed from Arab countries? As the Scarfe cartoon scandal rages on, read Melanie Philips' masterful blogpost, Britain's infernal cocktail of hate. Update: Harry's Place is having an interesting discussion on what Steve Bell does or doesn't understand by ethnic cleansing. "For Bell, Israel is itself a tyrannical entity which perpetrated the greatest possible atrocity upon the supposedly rightful inhabitants of the land, the Palestinians, by driving them out. For Bell, it is now clear, the outrage is not the behaviour of Netanyahu but the fact that Israel exists at all. "But of course, Bell’s belief is the very opposite of the truth. It was not the Arabs who were ethnically cleansed from Palestine; it was the Arabs who tried to ethnically cleanse the Jews from there, by mounting a war of extermination against the re-established Jewish homeland. It was the Jews, not the Arabs, who were the ethnic group with the overwhelming historical, moral and legal claim to the land, as the international community had recognised. And it was Jews – some 800,000 of them -- who really were then ethnically cleansed from Arab countries and who found refuge in Israel. "But then Bell does not appear to understand the moral difference between tyrants and their victims. For he also observed that no-one had objected to Scarfe’s cartoon the previous week which portrayed Syria’s President Assad slicing the head off a baby. It is certainly true that Scarfe has often drawn such images of Assad, such as this one, or this one, and regularly depicts tyrants steeped in blood. "But the crucial point is that Netanyahu is not a tyrant who murders innocents; Assad is. Netanyahu is defending his people against mass murder; Assad has been deliberately killing thousands of his own citizens in order to suppress revolution. Bell’s comparison is morally obtuse to a quite staggering degree. He appears not to understand the difference between a crime against humanity and the protection against a crime against humanity." The Tunisian Shems FM radio station cited a Tunisian security official who said the graves were damaged over the last month. Claims on Facebook had said the graves were vandalized on Jan. 23. According to the Shems FM report, Tunisian youths believing rumors that the Jews bury their dead with gold were responsible for the grave looting. Only a few Jewish families now live in Sousse, which had a Jewish community of nearly 6,000 at the time of Tunisia's independence in 1956. One Jewish-owned fruit juice shop, Pascal, is located in the city. According to TAP, the Tunisian state news agency, the office of Prime Minister Hammadi Jebali of the Islamist Ennahda party released a statement last Friday expressing "deep indignation at any criminal act undermining Tunisia's cultural and historical heritage," and said that efforts were under way to work with security forces and the judiciary to ensure that attacks on cemeteries and mausoleums stopped. The Tunisian Ministry of Culture recently announced that 34 shrines of venerated Sufi Muslim saints have been attacked by religious extremists since the country's January 2011 revolution ousted former dictator Zine El Abddine Ben Ali. According to this article, (French) the most recent vandalism came to light when a young Jew, David, was buried on 24 January. Efforts to keep vandals out of the cemetery since 2007 by building a high fence and reinforcing the entrance locks have been ineffectual. Jews from Sousse have demanded an official inquiry. Two events shook Jews the world over, on or around Holocaust Memorial Day: One, the pronouncements of a British MP, David Ward, accusing the Israelis of failing to learn the lesson of the Holocaust by 'committing atrocities against the Palestinians'. 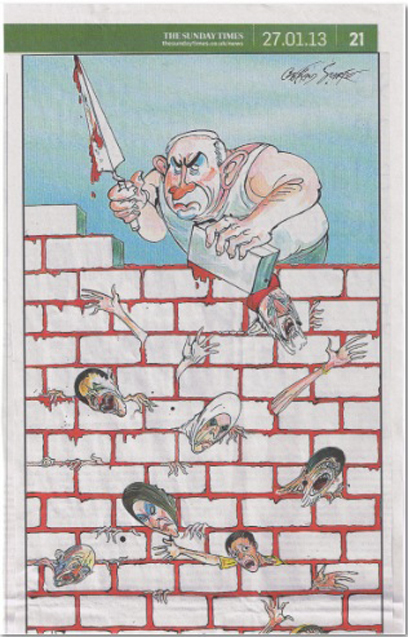 The other was an antisemitic cartoon (above) in the Sunday Times by the controversial Gerald Scarfe showing Benjamin Netanyahu building a wall with the blood of crushed Palestinians. But for all the furore and the condemnations, critics have been guilty of moral inversion, failing to see in Palestinian and Arab exterminationist intentions the legacy of a pro-Nazi past. *Take Matt Hill, who rightly condemned David Ward in his Telegraph Blog. But he also had harsh words for 'paranoid' Israelis: " (to use Amos Oz's words) half-hysterical refugees and survivors, haunted by dreadful nightmares”, "who see in the Arabs a reflection of their former oppressors." Many of today's Palestinians nurse the same genocidal intentions as the Mufti, try as they might to cloak their aims in language acceptable to western ears. Just read the Hamas charter. The difference between then and now, is that today's Jews have the means to defend themselves. *In response to a commenter to this Times article who thought there was 'peaceful coexistence' in Palestine before the establishment of Israel, L. Amior pointed out that the Mufti of Jerusalem broke the peace with riot after riot: "after inciting one riot too many against the British Mandatory forces, he escaped in 1937 to evade an arrest warrant. He went to Iraq, where he incited a pogrom against Jews in 1941, in which 180 were slaughtered. He then went to Berlin, where he actively collaborated with the Nazis, and helped create an SS division of Bosnian Muslims to fight for Hitler. "Here they are, having a fine time together. "As far as the West is concerned, Nazi blood-libel cartoons came to an end in 1945. As far as Jews are concerned, the cartoons never stopped: Arab blood-libel cartoons have filled that space since, daily. Hence the shock of seeing it in a British paper now. Thanks to the role of Hajj Amin al-Husseini as the bridge between the Arabs and Nazis, there is nothing to distinguish Nazi blood-libel imagery from its Arab cousin." *Such Jew-hatred is deep and all-pervasive in the Arab and Muslim world, suggests Hirsan Ayaan Ali in the Christian Science Monitor. "Millions of Muslims have been conditioned to regard Jews not only as the enemies of Palestine but as the enemies of all Muslims, of God, and of all humanity", she writes. "In the wake of the Arab Spring, as the people take a chance on democracy, they and their new leadership want to see their ideals turned into policy." She quotes a 2011 Pew survey: in Turkey, just 4 percent of those surveyed held a “very favorable” or “somewhat favorable” view of Jews; in Indonesia, 10 percent; in Pakistan, 2 percent. In addition, 95 percent of Jordanians, 94 percent of Egyptians, and 95 percent of Lebanese hold a “very unfavorable” view of Jews. That's why the West needs to take seriously Arab and Muslim anti-Jewish hatred and incitement, such as that of President ('Jews-are-apes-and-pigs') Morsi, and condemn it in the strongest terms. "... the really terrible thing here is not the grotesque misuse of the Holocaust, nor the vicious suggestion that ‘the Jews’ are guilty of behaviour that is somehow analogous to the Nazi genocide inflicted upon them, nor even the sickening insult that they have to ‘learn the lessons’ of their own suffering. "No, the true venom of these remarks is the way they reverse the position of today’s Jewish victims – the Israeli survivors of the Holocaust and their children and grandchildren -- and their current would-be exterminators – the descendants of Hitler’s Nazi collaborators in Palestine during the Holocaust. "For the fact is that Israel is not trying to exterminate the Palestinians – indeed how could this possibly be the case, since the Palestinian population has more than quadrupled since the rebirth of Israel in 1948. Nor are the Israelis oppressing the Palestinians, who have benefited from some of the highest rises in GDP and lowest child mortality ratios in the Middle East." Well, it is a peculiar way of helping the Jewish sons of the motherland that the Egyptian physician has come up with. In any case, “Jew” is a dirty word in Egypt and statements of the kind made by al-Erian are just what is needed to stir a political storm. No wonder, then that his statements drew criticism from all sides. One after the other, his colleagues in the Egyptian political establishment lashed out against him, pointing out that only a couple of days prior to the controversial interview, al-Erian had returned from a visit to the United States, where he had apparently been tainted by the American Jewish lobby. However, above all, he was accused of letting the demons out of the bottle. The return of the Jews, it was charged, would reopen the issue of the property they left behind. And the last thing the Egyptians need in their current economic crisis, when they are struggling for every pound, is to be faced with the loss of a huge fortune to reparation. No one can precisely tell the worth of the private property the Jews had to leave behind. According to unconfirmed estimates, it amounts to $1.5 billion at the least. To that, one should add the assets of the Jewish community, including buildings, synagogues, archive records and holy books, which were all nationalized by the Egyptians at the time and which the Egyptian government is unwilling to return to anyone. 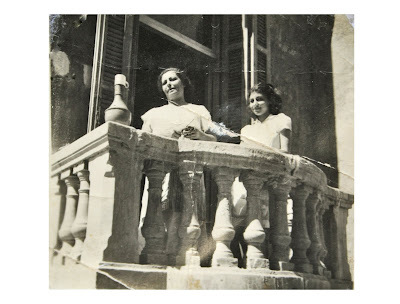 “My father, Victor Vidal, left behind a big publishing house in Cairo," says Levana Zamir. Zamir is the chairwoman of the Union of Egyptian Jews in Israel and president of the International Association of Jews from Egypt. She was born in Cairo in 1938 and at present, lives in Tel Aviv. Yet, the Jews from Egypt are known for their love of their ancestral origins and heritage. Emigrating from your homeland is one thing, but putting it out of your mind and heart is quite another, and far more difficult to do. It is especially hard in this case, bearing in mind that Egypt of the mid-twentieth century was a warm, embracing, multi-cultural country. However, it is rather in question whether the Jews who left it so much as think of returning to it. Avraham (Albert) Cohen, who serves as chairman of the Center for the Heritage of Egyptian Jewry, labels the initiative by al-Erian as “propaganda.” Cohen can boast a special kinship. He is the little brother of Eli Cohen, an agent of the Mossad who had been serving in Damascus and who was eventually exposed and executed there in 1965. Avraham was born in 1945 in Alexandria. His parents were originally Syrian Jews who emigrated to Egypt at the beginning of the twentieth century and settled in Alexandria. To this very day, the Israeli identity of Eli Cohen is denied in the Arab world, although he was acting on behalf of the Mossad. “He is an Arab who has betrayed his motherland; a Satan, a traitor. It is in hell that he will find his redemption,” then-Syrian president Amin al-Hafiz said at the time with reference to Cohen. Cohen discloses that many of the Jews living in Egypt then did not have Egyptian citizenship. Although his brother was seen by his executioners as an Arab, Avraham Cohen identifies himself solely as Israeli. Levana Zamir, on the other hand, says that she is an Israeli, but not only an Israeli. Meanwhile, the storm seems to have abated. Essam al-Erian has retired from office as President Mohammed Morsi’s advisor. He may have left the Egyptian President Bureau of his own free will or, at least, that’s how he himself presents it. However, it is obvious to all and sundry that he has been deposed. The affair has exposed the deep gap dividing the two neighboring countries. It also shows how the cynicism of politics prevails over sentiment and nostalgia. All the same, Levana Zamir believes that the affair has its positive aspects, as well. ”Now, at long last, the younger generation in Egypt realizes that there was a large Jewish community in Egypt once,” she says. Tunisia was the only North African country directly occupied by the Nazis in 1942. "Passing by the Jewish Cemetery in Tunis for Remembrance… for NEVER AGAIN. On the Holocaust Remembrance Day, I remember the 6 million victims, the Jews of the Arabic Middle East in particular who were also tortured and killed by Nazis. A list of some of the Jewish people killed by Nazis can be read here, in the Jewish Cemetery in Tunis. " These are some of the 5,000 Jews pressganged into labour camps under the Nazi occupation who were shot, tortured or beaten to death. Some 17 others were deported to death camps in Europe, never to return. The suffering of North African Jews in the Holocaust pales into insignificance compared to the plight of Jews in Europe. Had the Allies not liberated these countries, it would have been only a matter of time before their Jewish populations were systematically wiped out. Tu Beshvat, the New Year for Trees, is traditionally a much bigger 'deal' among Sephardi and Mizrahi communities than Ashkenazi. As the day draws to a close, here's an interesting article from Jewish Action and a Syrian-Jewish recipe to celebrate the festival. In agricultural-based ancient Israel, Tu b’Shevat—the traditional new year for trees—was a meaningful occasion celebrated with singing and dancing. Sephardim, who primarily lived in warm locales near the Mediterranean, long manifested a deep devotion to this festival, which they call Las Frutas (The Fruit). On the day of Tu b’Shevat, Sephardic families customarily visit relatives, where they are served a feast. The children, who are given off from school for the day, are encouraged to not only partake of the spread, but to take bolsas de frutas (bags of fruit) home with them. Among Ashkenazim, on the other hand, Tu b’Shevat was only marginally celebrated, primarily because it falls in the dead of winter in northern climates and the variety of fruit trees available was far more limited. The community of kabbalists, who made their home in sixteenth-century Safed, maintained a profound regard for this minor holiday and developed a new liturgy and rituals for it. An expanded version of these prayers was collected in an eighteenth-century work appropriately called Peri Etz Hadar (“Fruit of the Goodly Tree”), which describes the Tu b’Shevat seder (ceremonial meal). This ceremony contains rituals such as drinking four cups of wine—each wine a different type—and sampling at least 12 fruits and nuts; others increase the number to 15, corresponding to the numerical value of tu. Iraqi Jews further expanded on the concept, increasing the number to a minimum of 100 fruits, nuts, grains, and vegetables. Olives are a ubiquitous component of Middle Eastern mezes (appetizer tables) and many meals. Combine all the ingredients in a 1-pint jar. Cover and let stand in the refrigerator for at least 3 days and up to 3 months. Serve at room temperature. A poll in Akhbar El-Youm, Egypt’s most widely circulated state owned newspaper, asked readers whether they would agree with the idea of the Egyptian Jews who had been expelled from Egypt returning to the country. 79% percent stated that they disagree. 18% said that they agree. And 3% had no opinion. That’s not surprising as in a 2011 poll, only 2% of Egyptians had a positive view of Jews. Before the war, Egypt had an estimated 60,000 to 100,000 Jews. By 1976 that number had fallen to 200. Between then thousands of Jews were arrested, locked up or deported. Sustained persecution wiped out the Jewish population of Egypt. The same phenomenon has been taking place, at a slower rate, with Christians in Egypt. In the 19th Century, under the rule of the Imams, the Jews of Yemen became social pariahs, being forced to follow harsh and often humiliating rules -- they were forbidden from wearing new or flamboyant clothes, compelled to walk long distances on foot as riding donkey and mules were reserved for Muslims; they were also prohibited from engaging in money transactions. Reports estimated the Yemeni Jewish community to be standing at 30,000 with 200 in Aden - southern seaport - 10,000 in Sana'a, 1,000 in Sa'ada, 1,000 in Dhamar and 2,000 in the desert of Beydha. A series of mass migration to the Jewish of Israel left only a handful of Jews in Yemen northern highlands, the only remnants of a long exhausted line of Israelite migrants, who once upon a time sought refuge in the land of Queen Sheba. Yemen 2011 Revolution left the Jewish community ever more so vulnerable as sectarian tensions started to flare up again in Yemen, awaken by the Houthis' claims over provinces lying north of Sana'a and Sunni extremists clamoring for a return to Sharia law. With most of the remaining Jews of Yemen now living in a guarded compound in Sana'a, the dwindling community has said to be living a nightmare, with the walls of history literally closing down on them. Descent into Oblivion: Following a violent and bloody pogrom against the Jewish community in Aden, where 82 Jews were killed by rioters in 1947 and hundreds of home pillage, thousands of members of the community decided to immigrate to Israel. Between June 1949 and September 1950 some 50,000 Jews were shipped off the newly born Jewish State in the so-called Magic Carpet. Until 1962 the exodus continued. With only a few pockets left here and there in Yemen's highlands, the Jews of Yemen faded in the shadows, ignored by the central government and sought extinct by the international community. The murder in 2008 of Rabbi Moshe Yaish Nahara'i by the hand of radical Islamist prompted then-President Ali Abdullah Saleh to relocate the Jewish communities of Amran and Raidah to the capital, Sana'a, where he felt they would be safer. The issuance of a presidential decree saw the allocation of plots of land to some 50 Jewish families. In 2009, heightened tensions with al-Qaeda led the United Jewish Communities, the U.S State Department, local federations, and the Hebrew Immigrant Aid Society to work together to implement the evacuation of close to half of the remaining Jewish population in Yemen. The remnants were moved to a compound -70 Jews from northern Yemen - as the state openly admitted it could (not) ensure the community safety anywhere else. As Yemen was defiantly moving toward democracy following a three decades' long dictatorial presidency under the yoke of Ali Abdullah Saleh, the Jews of Yemen sought political recognition by demanding to be allocated seats in Parliament. Yemen Chief Rabbi Yehia Yussef Mussa told CNN Arabic back in May 21st, 2012, "I demand the government's new attention to this, to work to allocate seats for members of the community in the Consultative Council and Parliament, in order to feel real citizenship, non-discrimination, a right guaranteed by our law and the Constitution." Mussa emphasized at the time his community was keen to serve Yemen to the best of its abilities as any other citizens would. On May 22sd, 2012, Aaron Yusef Zindani was stabbed to death outside the U.S Embassy in Sana'a. Having been accused by a neighbor of witchcraft, Aaron received multiple wounds to its chest,back neck, head and stomach, which he was unable to recover from. The attack which was not per se sectarian motivated, however raise fear among the Jewish community that Yemen was no longer a place it could call home. The Last Straw: Yemeni-based Sawa'a Organization for Anti-Discrimination revealed on Saturday, January 19th, 2013 that the President Abdo Rabbo Mansour Hadi government had decided to suspend its funding for "the remaining 100-odd members of the country's ancient and internally displaced Jewish community." Sawa'a expressed deep sorrow at the news, stressing that without housing benefits and access to basic services the community had been left stranded, without any mean to support itself. The organization is now arguing the Jews of Yemen fall under the UNHCR in their capacity of IDPs, and therefore should receive "housing and safe living." Having been excluded from Yemen National Dialogue, Parliament and now mainstream society, the Jews of Yemen have very few options left; a return to the province of Sa'ada from which they forced out in 2008 or exile to Israel, where many before them found comfort in the knowledge they were amid their kins. 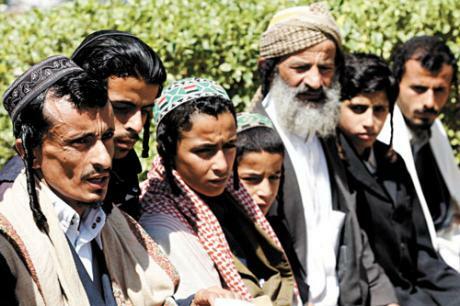 As Yemen enters its post-revolution era the pages of history are resolutely closing on the Jews of Yemen. 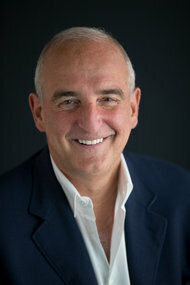 Does Roger Cohen finally get it? To this blog, New York Times columnist Roger Cohen is notorious for whitewashing Iranian antisemitism. But his plea to Hamas to abandon the 'blight of return' seems to infer that he recognises the antisemitism that drove Jews from the Arab world created an 'exchange of refugees'. "Extremes feed on each other; a majority in the middle is ready for a reasonable compromise that places the future above the past. That, in part, is what the two-year-old Arab Spring has been about: the future over the past. However faltering (what revolutionary movement was ever smooth? ), the awakening has been about overcoming an Arab culture of victimhood, conspiracy and paralysis in the name of agency, engagement and debate. The dinosaurs of the Palestinian movement, like Meshal, should take note. Pursuit of all of the land, with its accompanying “right of return,” is a form of perennial victimhood, one that has spawned some 4.7 million Palestinian refugees, several times the number who were driven from their homes in the war of 1948. The right of return would be better named the blight of return. It is a damaging illusion that distracts from an achievable peace in the name of Palestinian children and grandchildren nursed on hope. There is the possibility of compensation, but there is in history no right of return. Ask the Greeks of Asia Minor, the Turks of Greece, the Germans of Danzig and Breslau (today Gdansk and Wroclaw) — and the Jews of the Arab world. "In the Islamic Republic of Iran, there is a thriving Jewish community. It has its own synagogues, schools, a hospital, associations and even a member of parliament. Mostly accepted, Iran’s 10,000 Jews are protected by the Iranian regime, a concrete example of tolerance in the country. Some of them are so patriotic they even say they would defend Iran if they were attacked by Israel." Let's run that again, imagining this were a report on Israel's Arab minority. Substitute Jew for Israeli Arab: Arabs have their own mosques, schools, hospitals and a dozen members of Parliament - it's all true. Their population centres are also protected by law and by Iron Dome anti-missile batteries. Druze and Bedouin serving in the IDF have died for Israel. But the Arab 'narrative' of discrimination in Israel is so deeply embedded in western perceptions that such an anodyne report would be laughed out of court. So it is just as well that Richard Prasquier, who heads the French-Jewish representative body, CRIF, is in the France 24 studio to inject some balance into the story: Iran is showcasing its Jews in order to enhance its 'tolerant' image, but at least one of two recent murders had an anti-Jewish motive; and from one moment to the next the regime might find it appropriate to accuse its Jews of being Zionist spies, as it did in the 1990s, when 13 Jews were arrested on trumped-up charges. He might have added that Jewish calls are bugged, that the Jewish schools are run by Muslims and forced to open on Saturdays, that the Jewish hospitals have more Muslim staff and patients, and that the token Jewish MP is there to toe the government line. As for the community at large, they are hostages by any other name. And the biggest indictment of all is that the community has shrunk to one tenth of what it was. The Picture-A-Day website has unveiled more photographs from its Tunisian-Jewish collection. 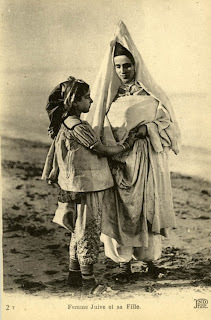 The above mother and daughter picture, taken 150 years ago on the Tunisian seashore, pops up in three different photographic collections - the Jewish Postcard Collection, the Yeshiva University Museum's collection and the Comfort Collection. 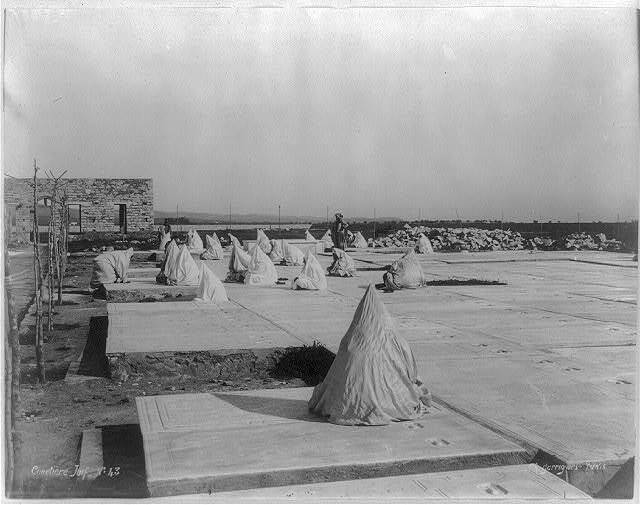 This photograph shows keeners, or paid mourners, wearing the traditional conical headdresses, in a Tunisian Jewish cemetery. Another good resource is the archive of the Jewish humanitarian agency, the American Joint Distribution Committee. Here's a wonderful picture of an exercise class taken at the Alliance school in Tunis in 1954. Wherever he goes, his opponents follow him, spitting and shouting, “Traitor!” On national television, he was deemed a heretic by Rabbi Ovadia Yosef, Shas’ spiritual leader. His books have been subject to public burning ceremonies in Israeli Yeshivot. He is accused of being “the seed of Amalek” – the traditional arch-nemeses of Jewish People. Haredi rabbi and former Shas MK, the renegade Amsalem represents the kind of Judaism that I grew up with. The kind of Judaism that was passed onto me by my ancestors; generations of renowned rabbis and dayanim (Torah judges) in Morocco. It is the kind of Judaism that is open, warm, tolerant, embracing, free from prejudice and above all, a Judaism that espouses “Torah im derech eretz” (the balance of Torah study with work); a Judaism that understands that the world keeps on moving forward, that there is room for science and Torah to coexist. Two days ago was the hilula [anniversary] of the death of Rabbi Yisrael Abuhatzeira, otherwise known as the Baba Sali. Shas frontrunner Arye Deri was in attendance, as was both the Sephardi and Ashkenazi chief rabbis. Amsalem was also there, but he only made an appearance at the grave after the others had left the scene, presumably to avoid a lynching. Amsalem battled his way through the throngs, shaking hands and stopping to chat to well-wishers who praised him for his bravery in taking a stand. All the while, Shas supporters were on his heels, hurling abusive terms in between wrestling with anyone that came in their way. Yet with each word and raised fist, the wry smile playing on Amsalem’s lips just grew larger. So Am Shalem can count on at least one of Maimonides’ relatives to cast the letter “tzadi” into the ballot box. This Hitler quote implying the genocide of the Jews did not go far enough got almost 2,000 'likes' on the Palestine News Facebook Page. In a TV interview recorded in 2010, the President, who heads the Muslim Brotherhood Freedom and Justice party, was heard to utter various slurs against the Jewish people, quoting Koranic suras calling Jews ‘descendants of apes and pigs’. Although Morsi’s 2010 rant has only just been released, the media had to be embarrassed into exposing it. The Egyptian president’s antisemitism may have come as a shock because the western press and media rarely report incitement by Arab press and politicians. Once the cat was out of the bag, Morsi’s outburst was duly condemned both by the media and the US government. But another remark this month, by another Arab leader, received next to no coverage at all: Palestinian President Mahmoud Abbas told a Fatah rally that the wartime Grand Mufti of Jerusalem, Haj Amin al-Husseini, was his hero. The media silence has been deafening. Almost no western reporters picked up on Abbas’s controversial rhetoric. *Because westerners want so badly to believe that these leaders are moderates they can do business with. President Morsi, we were reminded, was pragmatic enough to broker a truce in Gaza between Hamas and Israel. Abbas is Israel’s ‘moderate’ peace partner. *Because ‘the racism of low expectations’ does not demand better behaviour of ‘people of colour’: only ‘man bites dog’ stories are newsworthy. *Because the West habitually reverses cause and effect in its coverage of the conflict – Arab actions are understandable reactions to ‘Israeli aggression’. *Because the Palestinians have managed to deceive liberal opinion by cloaking their genocidal rhetoric in the claims of a ‘just cause’. The media are colluding in a cover-up of the three-way axis between Nazis, the Mufti and the Muslim Brotherhood. The Palestinian national movement was founded by the Mufti. After WW2 Haj Amin al-Husseini was appointed head of the Muslim Brotherhood in Palestine. His legacy of Nazi-inspired eliminationist Jew-hatred is alive and well not just among the Palestinians, but across the Arab world. But the fascism inherent in the pronouncements of Morsi and Abbas is the key to understanding why there is still an Arab-Muslim conflict against Israel. Such fascism the Western media is loath to reveal. Why is the West frightened to condemn fascism in ‘people of colour’? Is it because the West sees itself guilty of worse crimes against them – colonialism and imperialism? It is essential to report what Mahmoud Abbas says because the Palestinian Authority leader considers himself as the heir to the Mufti’s struggle to liberate Palestine from the Jews. And he has plenty of support: an apparent Hitler quote implying that the genocide of the Jews did not go far enough garnered nearly 2,000 ‘likes’ on the Facebook ‘Palestine News’ page. The West is in danger of over-rating these two leaders’ pragmatism. Both the PA and the Muslim Brotherhood have embraced Jew-hatred as ideology. Update: This Arutz Sheva article claims that 60 Yemenite Jews have been airlifted to Israel via Qatar. The Yemeni government has cut off funding for the remaining 100-odd members of the country’s ancient and internally displaced Jewish community, a Sanaa-based NGO said on Saturday. Most of the remaining Jews in Yemen now live in a guarded compound in Sanaa after they were driven from their homes in Saada by al-Qaeda-aligned anti-government forces in 2007. According to Sawa’a, media access to the compound is restricted, and, in October, several Sawa’a staff members were arrested during an attempted visit. “The return of Jews to Saada currently is not possible,” as such a move would entail “a direct threat to their lives, their safety and security,” the organization said. Sawa’a, in conjunction with current community rabbi Yahya Yusuf, was working to restore Jewish property lost to the al-Qaeda insurgents, Israel Radio reported Sunday. In December, Sawa’a protested the exclusion of the Yemeni Jewish community from a national conference that was meant to promote dialogue between various groups in the civil war-torn country. At the time, it was reported that the organization had issued a report documenting the discrimination against the country’s Jews, including their political disenfranchisement and lack of access to jobs and education. Campaigner for Jewish rights in post-Gaddafi Libya David Gerbi witnessed his relationship with his Berber (Amazigh) allies shot down in flames when he was snubbed by the Amazigh conference at which he was due to speak. A recording of his speech was not even aired, the Jerusalem Post reports. Gerbi, who fled Tripoli with his family in 1967 when the Six Day War led to attacks on Jews in his neighborhood, intended to offer (World Organisation of Libyan Jews) WOLJ’s support for the persecuted Amazigh minority (often referred to as Berbers). He also planned to speak up for the rights of exiled Libyan Jews to restore their over 2,000-year-old heritage and participate as equal citizens in building a new democracy. Gerbi was uninvited after the December 31 attack on Misrata’s Coptic Church in which two people were killed. They said the “Supreme Security Committee” was worried about his safety and suggested he not come personally, but send a video of his speech instead (his speech was not aired). Italian Foreign Ministry sources told the Libyan-Italian- Jewish Gerbi that they had received information that his participation in the Amazigh Congress would unleash further terrorist attacks in an escalating conflict. Besides having a significant numerical presence in what is now called Iraq for more than 2,500 years, the Iraqi Jewish community of the first half of the 20th century accounted for much of the so-called classical Arabic music scene there and, in fact, in much of the rest of the Arab world. The Al- Kuweiti brothers, for example, were among the brightest stars in the Iraqi entertainment firmament and were the darlings of such fellow luminaries as legendary Egyptian diva Umm Kulthum and compatriot singer and composer Mohammed Abdel Wahab. With that in mind, establishing a permanent exhibition of musical instruments used in Iraq prior to the mass aliya of Iraqi Jewry in the later 1940s and early 1950s seems only natural. Financial considerations notwithstanding, yesterday evening a permanent display of instruments, such as ouds, qanouns and various drums, was officially opened at the Babylon Jewry Heritage Center in Or Yehuda. One of the principal driving forces behind the initiative was renowned 74-year-old Iraqi-born sculptor Oded Halahmy, who divides his time between Jaffa and New York. Halahmy hails from a well-to-do Baghdad family that came to Israel in 1951. He has fond memories of his childhood environs, where he first tried his hand at the craft of sculpting. “Iraq was, and is, a land flowing with milk and honey,” he says. The use of the present tense is not a matter of nostalgia-infused selfdeception or wishful thinking. Unlike almost all his fellow Iraqi-born Jews, Halahmy has had the privilege of being able to visit the country of his birth several times since the Americans stepped in there. “I have been to Baghdad quite a few times in all sorts of capacities, but I am not ready to talk about exactly what I did while I was there,” he says, although revealing that he has a literary date coming up in the Iraqi capital. “I have been invited to go to the National Library in Baghdad to read from my book of poetry, which came out in three languages – Arabic, English and Hebrew,” he says. The tome in question, called Art Home Lands, was inspired by the three cities he has called home over the years – Baghdad, Jerusalem and New York. Halahmy has also published books on sculpture and Iraqi cuisine. In addition to the material and culinary riches of his early years – he conducted much of the research for his cookbook in Baghdad, including rediscovering the secrets behind his mother’s gastronomic creations – Halahmy happily recalls some of the musical experiences he had back then. “My parents loved music, and the exhibition in Or Yehuda is dedicated to their memory,” says the sculptor. There was also live music on offer in the Halahmy household. “We lived in a very big house, and all sorts of festive occasions and weddings took place there,” Halahmy explains. Percussion and voice were particularly important components of the musical entertainment. “There were always dakata, who were women who played drums and sang, and improvised songs on the spot about, for example, the hosts or the bride and groom. I remember the dakata who played at my brother’s bar mitzva. Everyone drinks arak, and the dakata play and sing. That’s why there are percussion instruments in the collection in Or Yehuda,” he says. Is Egyptian historian Khaled Fahmy objective? Point of No Return was asked by BBC Watch to comment on an article written by Egyptian historian Khaled Fahmy in Al-Ahram. The article was recommended on Twitter by a BBC producer, Hugh Sykes. Khaled Fahmy seems to be the Simon Schama of Egyptian history – a smooth, western- educated history professor at Cairo’s American University. Lately, he seems to be in much demand in the Egyptian media, giving his two piastres-worth on Egypt’s thorny Jewish question in Al-Ahram - approvingly Tweeted by BBC producer Hugh Sykes. But how objective a scholar is Fahmy, asks Point of No Return blog – and has he broken with the Arab tradition where historians are propaganda agents for the regime? PoNR’s comments are interspersed below. “Since Muslim Brotherhood leader Dr Esam El-Erian issued his call some two weeks ago to Israeli Jews of Egyptian origins to return to Egypt the social and print media have been abuzz with all kinds of speculation about the meaning, purpose and possible repercussions of this call. And while clear answers are yet to be found, the fact remains that this call has triggered public debate about a topic that has been taboo for decades. PoNR: True enough. Two thousand years of Jewish history in Egypt have been well-nigh erased from Egypt’s history books. “And while there are many reasons for the scarcity of solid academic research on the history of Egyptian Jews in Arabic (there are a number of good works in English), the fact remains that one of the main reasons for this sad situation is the unavailability of original official documents, a fact that one easily experiences in the Egyptian National Archives (ENA). For while one finds ample documentation in the ENA about all aspects of Egyptian Jewish history during, say, the Ottoman period (ie 16th-19th century), one would be hard pressed to find a single document about Jewish life in the 20th century. PoNR: Not just foreigners but greedy Egyptians have sought access to these title deeds. Access even to communal documents – the state claims these as its property – has been denied to the rightful Jewish owners, lest Jews use them to try and recover or demand compensation for property lost - that the Egyptians themselves have estimated worth $30 billion. Egypt is terrified of disclosing historical records which would show the scandalous scale and manner that its 80, 000 Jews were dispossessed and ‘ethnically cleansed’. PoNR: After 1948, the penal code made Zionism a crime. The charge of disloyalty could be leveled against any Jew. But talk of disloyalty is a bit rich, when as early as the 1920s, Egypt was practicing a double standard on citizenship. As a result of Egypt’s 1929 Nationality Law, more than 90% of Egyptian Jews were denied citizenship, regardless of how many generations they had lived in Egypt. In the 1940s, roughly one quarter of Jews held foreign passports, less than one quarter held Egyptian citizenship and the remainder were stateless. “Have these Jews been living in Egypt for many centuries or were they new arrivals? When did they leave Egypt and why? Where did they go after they left Egypt? Is it true that most of them ended up in Israel? If so, is that not proof of their Zionist beliefs and lack of loyalty to Egypt? And who was behind their exodus from Egypt? Given the unavailability of reliable original sources, it is difficult to answer any of these questions with any degree of certainty. Thus, the following facts should be accepted as true until someone comes along to refute them with documented information. There were indeed Egyptian Jews. Before 1948, they numbered between 65,000 and 80,000; in Cairo, a few of them lived in the Jewish Quarter (Harat Al-Yahud) and in Darb El-Barabra, while in Alexandria they lived in Harat El-Lamon; but the majority lived everywhere else in Cairo in the districts of Abbassiya, Gamaliya, Abdeen and Sayeda, and everywhere else in Alexandria and in many cities in the Delta. A few of these Jews had settled in Egypt since ancient times, sometimes well before the Arab conquest of Egypt, but the majority came to Egypt in the 19th century, fleeing the European pogroms. PoNR: Some Jews arrived from Russia fleeing Tsarist pogroms but it is misleading to suggest that the majority of 19th century immigrants came from Europe. Most arrivals came from other parts of the Ottoman Empire – Greece, Turkey, Syria, Iraq (where the Jews had lived 2,500 years). They were not in search of the Dolce Vita, as Fahmy frivolously puts it, but moved to Egypt because the Suez Canal had opened new trading opportunities. “Historical evidence suggests that the majority of these Jews were wholeheartedly Egyptian, with strong bonds and compassion to their Muslim and Coptic brethren. Some of them spoke Arabic besides three or four other languages, while others, such as Grand Rabbi Haim Nahum, were so eloquent in Arabic as to be a founding member of the Arab Language Academy (1932). Some were wealthy and owned fancy department stores and considerable real estate, such as Youssef Cicurel whose family came to Egypt in the 19th century, and was a founding member of Banque Misr. Others were poor skilled workers: every neighbourhood in Cairo had a Jewish electrician, grocer, secretary or seamstress. PoNR: This is broadly true – and Fahmy should be given credit for saying so. PoNR: It is not worthy of a historian to dredge up the 1954 Lavon affair – the stock propaganda argument blaming the Zionists for the exodus of the Jews. The affair was an embarrassment to Israel but had minimal impact and caused no casualties. There is no causal relationship between the Lavon affair in which three bombs failed to go off and Nasser’s expulsion of 25,000 Jews two years later. PoNR: Nasser did not just target wealthy Jews, but all Jews. He didn’t just target French and British passport-holders because of the Suez crisis. Even Jews of Greek and Italian and Egyptian nationality were expropriated, sacked from their jobs and forced out. PoNR: A nice story which humanises Jews to Fahmy’s Egyptian readership – an all too rare occurrence. Haroun was a member of a group of Jewish communists. The fact that these were not Zionists but were forced out or prevented from returning, along with the rest of the Jewish population, shows the antisemitic nature of Nasser’s policy. PoNR: Copts were also targeted by the Muslim Brotherhood in the 1940s. Elsewhere Fahmy says that the Muslim Brotherhood had ‘more than a hand’. Here he says that ‘much of responsibility’ for the Jewish exodus lay with the Muslim Brotherhood. Fahmy seems to shift the blame between Israel, the Muslim Brotherhood and Nasser depending on his audience or his mood. PoNR: Where has Fahmy been these last years? There has been a steady exodus of Copts over decades. In the last two years, since the Arab Spring brought the Islamists to power, the trickle has swelled to a flood – some 100, 000 are estimated to have left. Yes, it could well happen to Morcos. In summary, Fahmy, who obviously has no great love for the Muslim Brotherhood, should be given credit for trying to correct some of the distortions which plague the way the exodus of the Egyptian Jews is presented – but he still has some way to go before he could be considered ‘objective’.